SOUND TYPE SETTINGS: Choose the sound type: Tones (default), Voice Announcements, or None. In Android version, setting is under the app menu 'Settings'. In iOS the settings are under the device settings, look for 'RaceTac Committee'. START PENALTY FLAGS: Choose a 'Rule 30' prep flag. I, Z, U, Black Flag, and Z with I. Android: Select in the menu. iOS: Coming soon in 2.30. Status Area: An image of the next or current flag involved in the upcoming event. Or a boat image if not within the start sequence. And a status box showing the next event requiring committee action. Regatta Start: This is the actual start time of the FIRST Race. The 'Warning' will be 5 minutes earlier, and any 'Pre-Warning Alert' 1 minute before the warning. The default is the existing saved time. Tap the word 'SET' to change it as needed for iOS, or the clock or calendar icons on Android. Pre-Warning Alert: An Optional Alert, sounded one minute before the usual 'Warning' for the first division only. Division Gap: The number of minutes between one Division's start and the next Division's Warning. Zero would be the traditional 'Rolling Start' where one Division's Start is the Warning for the next. NOTE: You do not have to add divisions. 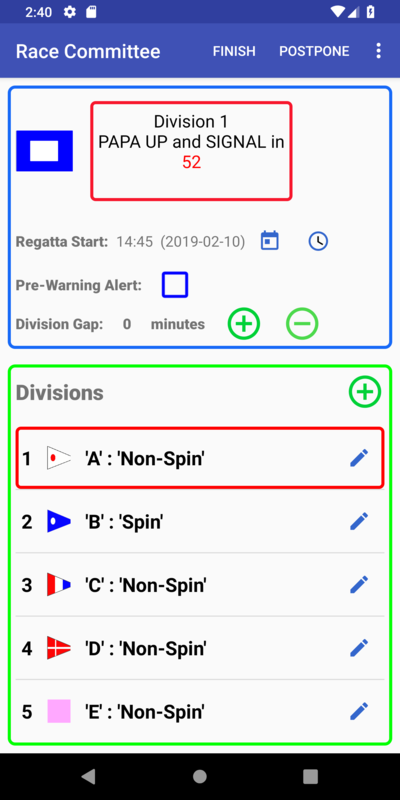 The App will asume a single division start sequence if you don't add any. Tap the '+' to pop up a dialog to add a Division. ID: Enter the short 'ID' such as a number, or a letter. Enter a 'Type' which could be a class name such as 'Spin', 'Non-Spin', 'IRC', or perhaps a boat type for a one-design. Choose a sequence with the drop down spinner. The Division order is defaulted to be the last one, but can be moved up. If moved up, all other Divisions are moved down. Choose a flag from the flag icon dropdown. Currently offering common solid colors as well as the numeric flags (in numeric order). Editing and Deleting Divisions: Tap the button on the right of the Division entry ('i' for iOS, a pencil icon for Android) to pop up and edit dialog. Works the same as the 'add' dialog, but with a 'Delete' button. Tap Clock inside red border to log a time entry. Log has most recent time at top, highlighted. Log is automatically saved, and restored when app is restarted. Tap 'Night' to change colors for better night time visibility. Tap 'Clear' to clear the log. Tap 'Email Log' to pop up the mail app and send the log as a CSV attachment. 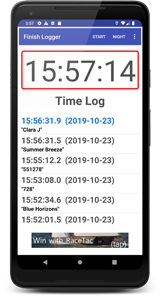 Filename will be 'RaceTacLog_.csv' where the timestamp will be of the most recent time in the log.